Inner Mongolia Eastern Power Co., Ltd. In order to ensure the stability and economy of ultra-high voltage grid in construction, we need to research the intelligent control method of ultra-high voltage grid. Using current method in ultra-high voltage grid construction, there is a problem of poor stability. Therefore, this paper proposed an intelligent control method of ultra-high voltage grid. This method analyzed the transmission capacity of power grid and electromagnetic loop operation, and used the genetic algorithm to compute the optimization model, finally analyzed the stability of the power frequency voltage completing the intelligent control of ultra-high voltage grid. Experimental results show that this method has high practical value. Y. Li, “Intelligent Control Technology of Ultra-High Voltage Grid,” J. Adv. Comput. Intell. Intell. Inform., Vol.23, No.1, pp. 67-71, 2019. L. X. 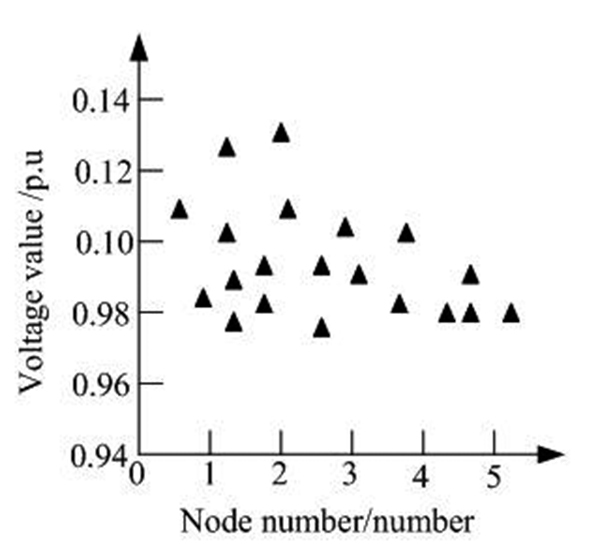 Sun, Y. Chen, Z. Wang et al., “Optimal control strategy of voltage source converter-based high-voltage direct current under unbalanced grid voltage conditions,” IET Generation Transmission & Distribution, Vol.10, No.2, pp. 444-451, 2015. B. Berggren, K. Lindén, and R. Majumder, “DC Grid Control Through the Pilot Voltage Droop Concept – Methodology for Establishing Droop Constants,” IEEE Trans. on Power Systems, Vol.30, No.5, pp. 2312-2320, 2015. S. Wenig, F. Rojas, K. Schönleber et al., “Simulation Framework for DC Grid Control and ACDC Interaction Studies Based on Modular Multilevel Converters,” IEEE Trans. on Power Delivery, Vol.31, No.2, pp. 780-788, 2016. X. Zhou, H. Sun, B. Zhao et al., “Applying high-voltage direct current emergency control to suppress the peak value of ultra-high-voltage tie-line power oscillation,” IET Generation Transmission & Distribution, Vol.9, No.16, pp. 2485-2492, 2015. G. Stamatiou and M. Bongiorno, “Power-dependent droop-based control strategy for multi-terminal HVDC transmission grids,” IET Generation Transmission & Distribution, Vol.11, No.2, pp. 383-391, 2017. Z. Xie, X. Zhang, X. Zhang et al., “Improved Ride-Through Control of DFIG During Grid Voltage Swell,” IEEE Trans. on Industrial Electronics, Vol.62, No.6, pp. 3584-3594, 2015. J. An, X. Chen, M. Wu, and J. She, “A Review of Recent Developments in Advanced Computational Intelligence and Intelligent Informatics,” J. Adv. Comput. Intell. Intell. Inform., Vol.20, No.4, pp. 497-503, 2016. O. A. Urquidez and L. Xie, “Singular Value Sensitivity Based Optimal Control of Embedded VSC-HVDC for Steady-State Voltage Stability Enhancement,” IEEE Trans. on Power Systems, Vol.31, Issue 1, pp. 1-10, 2015.